Veena Gokhale is a Montréal-based writer whose forthcoming novel, Land for Fatimah, tells the story of four strong women against the backdrop of international development and a community displaced from their fertile agricultural land in Africa. Coach House Books, Exploded Views Series, 2017. When it comes to word association, some words are more potent than others. Like curry. “Curry isn’t real . . . . It’s a leaf, a process, a certain kind of gravy with uncertain ingredients surrounding a starring meat or vegetable . . . but it’s also an Indian fairy tale composed of cooks, Indians, émigrés, colonists, eaters, readers, and writers. So begins Toronto-based writer Naben Ruthnum’s dazzling and long essay, which successfully marries erudite, penetrating socio-cultural and literary analysis with a personal exploration of eating, reading and race. Ruthnum’s parents immigrated to Canada from Mauritius. Trying to grow up “Canadian” in Kelowna, British Columbia, he visited Mauritius just once, at age 9. While he proudly claimed the “curry” made at his home as authentic and defended it as part of his cultural identity, he rejected “curry books.” These were books authored by people with Indian names, with stereotypical fonts and images on their covers. 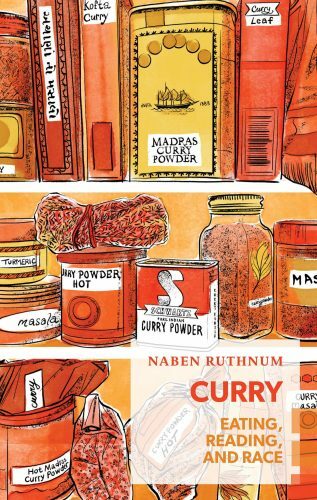 In the book’s first section, “Eating,” Ruthnum deconstructs food writing, including recipe books, bringing in his own experiences of making and eating curries. Myth making and romanticism abound here, with memories of grandmothers’ and mothers’ kitchens. But cooking “authentic family recipes” comes hard to the second generation, given the imprecision of the recipes handed down from relatives! And some then resort to buying cookbooks by Indo-British cooking celebrity, Madhur Jaffrey. There are of course more subtle and nuanced curry books, very much part of great South Asian literature. Ruthnum details a number of authors and books of this kind. But since the somewhat problematic success of curry books, which after all pander to stereotypical views rather than exploring new ground, South Asian writers in the diaspora started getting a strong message on what kind of book they should write. There is a growing Western and diaspora audience for such books, and the sub-genre includes Western writers like Elizabeth Gilbert (Eat, Pray Love). There are ironic and lighter moments in the book like Pakistani-American novelist Soniah Kamal’s “mango” dilemma. Not wanting to pander to an “orientalist Western gaze,” she mulls over the issue, finally allowing her characters to eat the fruit in a summer scene set in Pakistan! Tropes reflect real circumstances, says Ruthnum, who feels some sympathy for the affirmation of alienation that makes (some) readers turn to curry books. Despite all obstacles, Ruthnum demands multiple narratives spanning many genres from culture (not just literature) about and by brown people, and finds South Asian stand-up comics already taking this on. He has set aside his first novel, with some curry book connotations, for now, and will be publishing a thriller instead (Find You in the Dark) in 2018. The book will be published under the pseudonym Nathan Ripley. A copout? In “Curry” he offers a convincing argument for why he chooses to go this route.